As indicated in part 1, Birkenau didn’t exist prior to the Nazi regime. It was built in 1941 as the largest of 40 sub death camps that made up the Auschwitz complex. 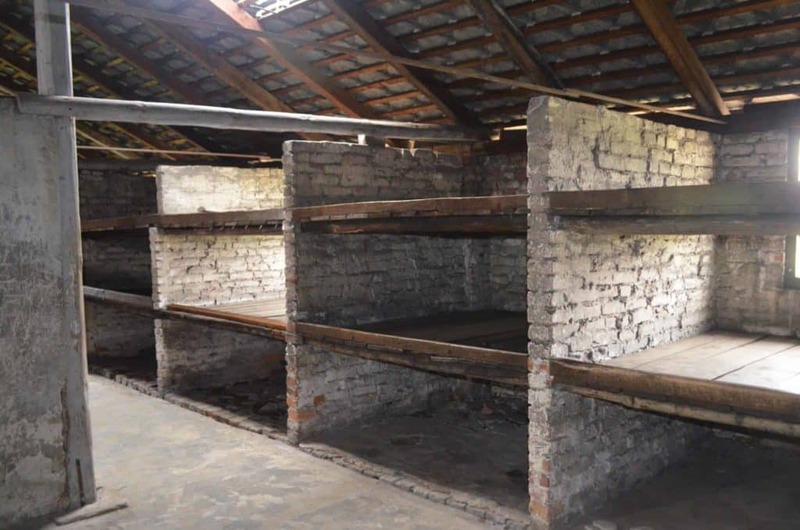 It was open for a total of three years, and was the place where more than 90% of the Auschwitz victims were murdered or died, most of which were exterminated in the gas chambers. Although the true amount of victims will forever remain unknown, it is estimated that this number totals over one million. After a short bus ride we arrived at our final stop of our visit: Auschwitz II, Birkenau where we came face with another iconic death camp image: that of the train tracks leading through the gates and straight to the crematoriums. 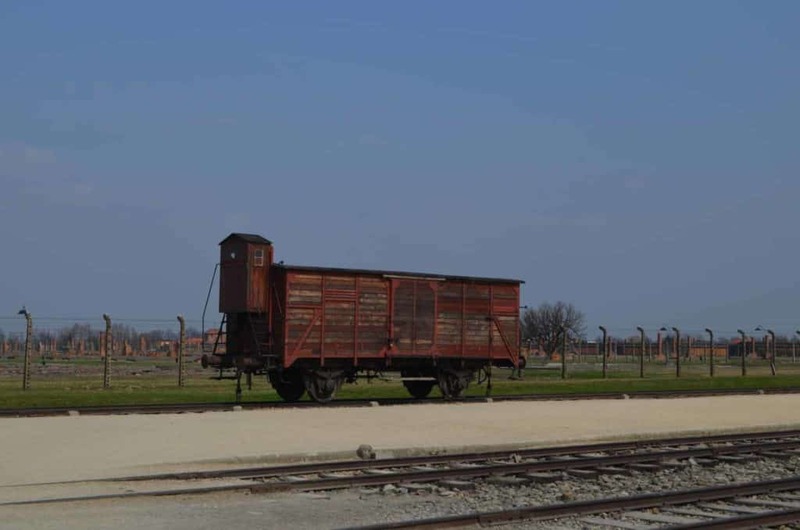 A lone rail car sits aside the tracks, a monument to the over 400 000 Hungarian Jews deported to the camp between May and August of 1944. 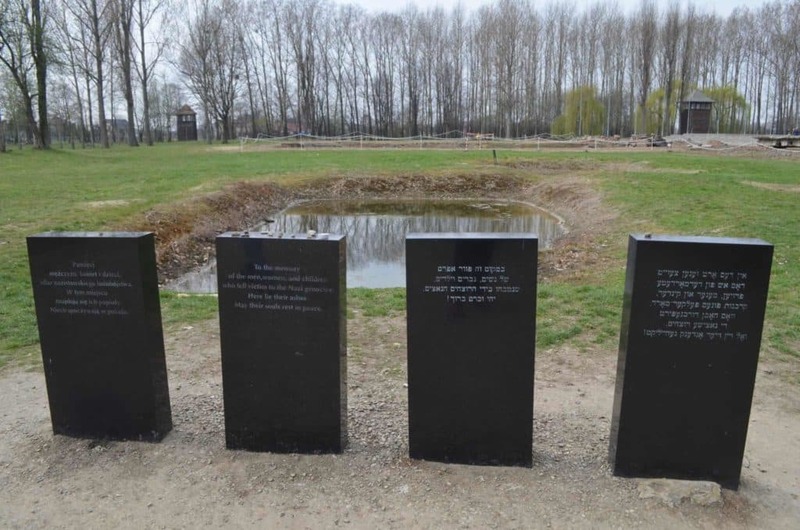 It stands about halfway between the gates and the crematoriums; in the spot where the SS doctors would divide the prisoners based on who was able to work, and who would go straight to the gas chambers. The majority of the victims were sent to their death, but that still left thousands to slavery. As we walked in the dirt beside the train tracks we were able to take in the enormity of the area. 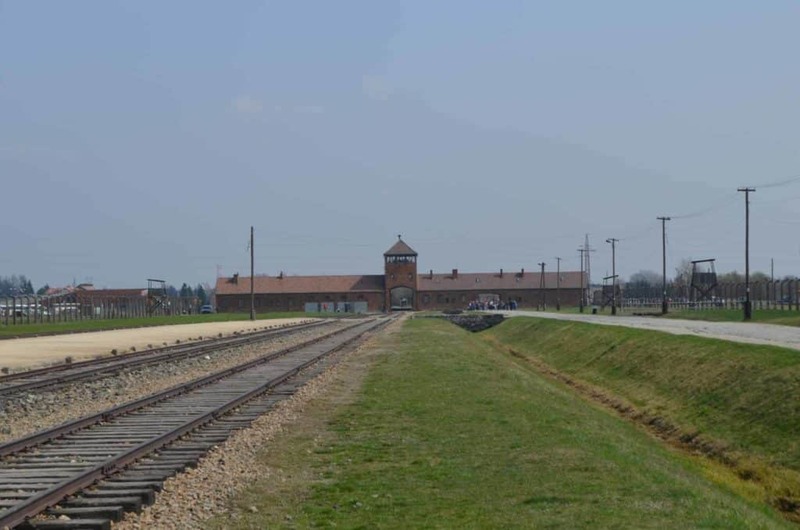 Birkenau was the largest of the Auschwitz camps, and could hold more than 900 000 prisoners. The walk seemed to last forever as we passed building after building, or more commonly, fireplace after fireplace as that was all the remained of the majority of the buildings. 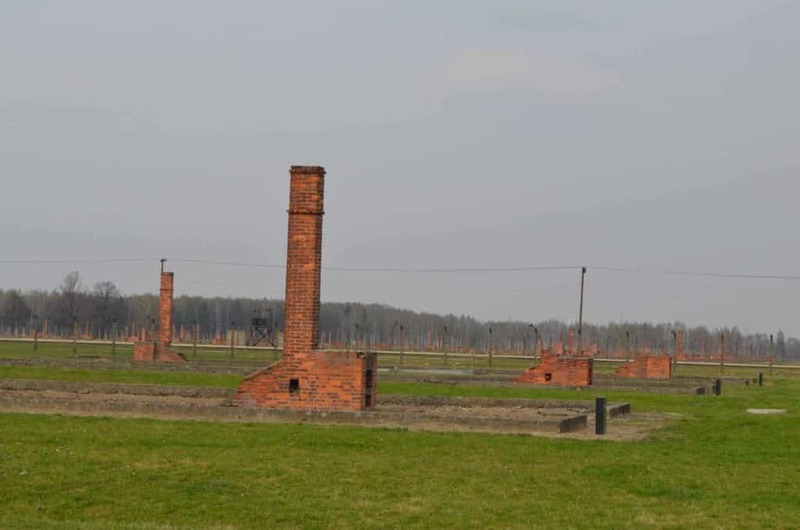 The poor condition and lack of funding resulted in the demolition of the majority of barracks, but the remaining chimneys stand as a reminder of how immense the death camp actually was. The barracks that remain are slowly deteriorating as well, but were safe enough for our guide to show us through a couple. We started in a building in which the prisoners would sleep; the floors were cold and hard, and the bunks-shoved up against the walls, towered three levels high. “How many do you think slept on those bunks?” our guide asked us as we started in dismay at the poor living conditions. “Six?” an elderly man asked; no doubt assuming that was a generous number, a lot of people to be shoved in the area. With that image left in our minds she led us outside, and across to the washing building. There was a long trough to be filled with water. Soap dishes lined the sink but our guide explained that they were just for show for inspection; the prisoners were never given any soap. In the adjoining room holes carved into the floor served as toilets, one beside the other with no privacy to be found. We were told that prisoners had five minutes to use both areas; often not allowing time for both washing and use of the toilet with the enormous amount of prisoners. Now that we had seen where the prisoners lived, it was time to move on and see where they were murdered. 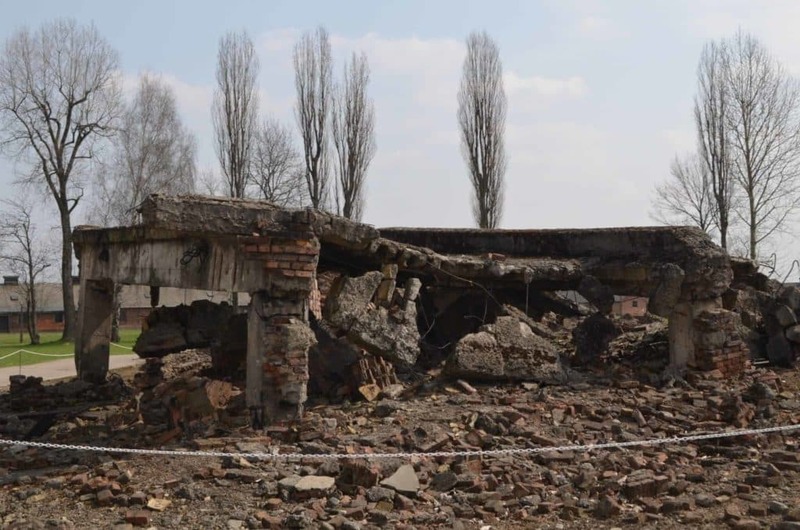 Unlike in Auschwitz I, the crematorium here was not intact. Knowing they were discovered the SS managed to bomb the building prior to liberation. The remains, however, are still intact and part of the museum today. As out tour came to an end we made our way to the back of the camp, to the memorial beside the crematorium. There, in front of a small pond were four gravestones inscribed with the same message in four different languages. The pond, our guide told us, was the grave of an innumerable number of victims; their ashes dumped here, with no thought, after being cremated. Our small group paused here for a moment of silence. Then each of us picked up a small rock or pebble to put on top of one of the stones, a Jewish tradition, promising that we would always remember. 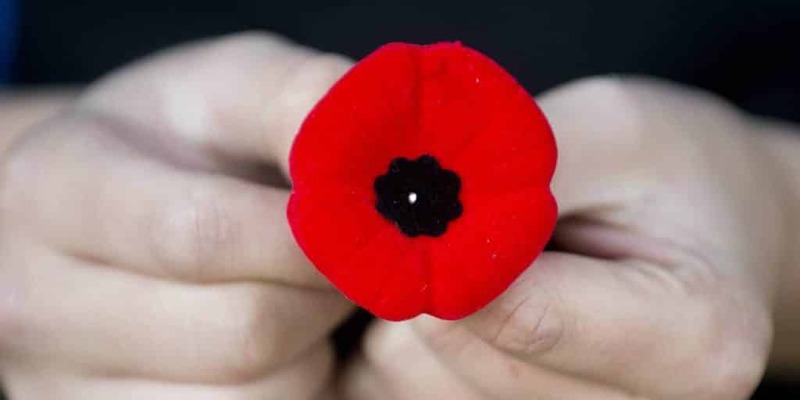 Today, November 11th, is Remembrance Day in Canada. Please take a moment to remember those who lost their lives during the war, and those who fought bravely and sacrificed themselves so that we could have the rights and freedoms that we enjoy today. Lest We Forget. I think it’s very important to tour places like this, so we can truly grasp the severity with our own eyes. I can only imagine what it was like for those poor people. I’m glad you got to visit here…I don’t know if I’d be able to hold it all together, mind you! I’ve been to Auschwitz twice now and I can’t stress enough how important it is that everybody visits such a place at least in their lifetime. So that we won’t forget and remember to treat each other with respect, no matter what your color or religion is..
My visit to Auschwitz changed the way I react to memorials of any kind. I actually sat and shivered my way thru this post. I cry very easily regarding Auschwitz and the war… most recently in Slovakia we visited the last remnants of the Iron Curtain, it’s under a bridge which goes across the Danube and is the border with Austria. There is a bunker, some of the barbed wire fencing right in what’s now a children’s play park. If you walk to the bank of the river it has names of people who died there, when they died and how they died. I bawled like a baby. I can’t get my head around how evil people were. Wow that sounds incredibly moving. I had a similar moment in Budapest at the Shoes on the Danube Memorial. Absolutely shattering. Seeing these images are a remainder for all that we never want to see or experience anything like this ever again. We have so much freedom now, it would be difficult to imagine being kept in such a place, being treated so inhumanely. On a recent trip to Sachsenhausen near Berlin, we were speaking to our guide and he mentioned that a trial had recently taken place where a woman and her daughter had been accused of war crimes and they responded by saying that they couldn’t see what they had done wrong. Even today, they stood by their beliefs that what they had done back then, in supporting the movement to eradicate others, was OK. That upset me just as much as walking around the remains of such a horrific site. I’ve always wanted to visit some of the concentration camps. My grandparents were from Germany and immigrated to the US when Hitler started taking power. I can’t even imagine some of the horror in how they lived at these camps, and what they must have gone through. Great post! Thanks Katie, you should definitely visit should you have the opportunity. Good post. I’m debating the right time to go and visit at the right age with my daughter. Just reading the post made me want to weep and feel sick but I know how important it is. I think the hard thing too is coming from the US, we’ll want to do other things when in the area but how do you go from sightseeing/touring to concentration camps without feeling terribly guilty or unable to enjoy any other part of your trip? We really need to think about the right time to make this journey. Thanks Tamara. It is absolutely hard, but I’m so glad I went. It really opened my eyes more to the reality and severity of what happened. Being a fellow North American its hard to imagine it was real from our lessons in school since we don’t have any physical damage here as a result. It’s hard to figure out the right age to take you daughter but when you feel she is ready I do highly recommend it. It’s a half day trip- I know some companies offer it in conjunction with a visit to the salt mines in the afternoon- that may be a positive thing to do after. I have yet to visit, but it’s somewhere I had wanted to go while in Europe. Unfortunately we never made it up that way, but I’m hoping to on my next trip in 2015. I do think it’s important to visit sites like this. I know that many people feel it important to visit this kind of attraction, but I feel immortalizing the terror that took place here is not a good thing. Maybe it’s selfish of me to say, but I feel we should focus on positive aspects of our history, not the negative. Interesting point of view. Personally, being from Canada which has no left over proof of the war (bullet holes, bombed buildings etc.) it’s too easy for us to think that the war was just a story. For me, seeing it for myself, put it in a whole new perspective. I have to say I didn’t understand why these places existed as “museums” until I visited the 9/11 memorial. I was very skeptical in the beginning but I’m so glad I went. We cannot erase history, as much as we want to forget many of these awful events, but we can learn from them, and honor the people that went through such horrendous experience. I have visited several of these places around the world and the feeling leaving is always the same; disbelief with the question of why and how. They certainly change your view on the world. I was really touched by Birkenau. The train tracks and the memorial at the end moved me to tears. I was impressed by how respectful everyone was. Great post Hannah. What a depressing place to visit! Not exactly what’s on most people’s idea of a travel destination, yet such an important part of history that it should be. I met a lot of people who avoided it because ‘it was depressing’… personally I think it’s something everyone should experience. I’ve been there as a kid. I think that now, almost twenty years later it’s time to go back and figure this place out for myself. Or at least try to. Thanks for the post. I love travel articles on uneasy spots. Very powerful stuff. It can’t be easy to see in person those reminders of those horrific acts of evil. But I do think it’s important to never forget what happened. This is such an important visit. It’s important that we remember where we’ve been so we can grow as individuals and human beings. I’ve visited Hiroshima, Pearl Harbor and many other WW2 sites and it’s always so sobering. Great post. I read both Part 1 and Part 2 back to back. I visited during the summer and it was a very hard day (I wrote about it too).. I didn’t realize how little our schools actually taught us about it until I visited and learned more about it. I agree with you that visiting is very surreal. You can’t really grasp that you’re actually standing in the place where so many people lost their lives, and how peaceful it all looks today. I still can’t believe what human beings are capable of doing to each other, and it’s sad that it still goes on. Great posts, Hannah! Thanks Anna! I read yours when you posted it over the summer. Even though we saw the same things it’s interesting to read everyone’s experiences. Hard to write about though! Your posts broke me. I read both Auschwitz Part I and II and I’m sitting here with tears streaming down my cheeks. Well written.